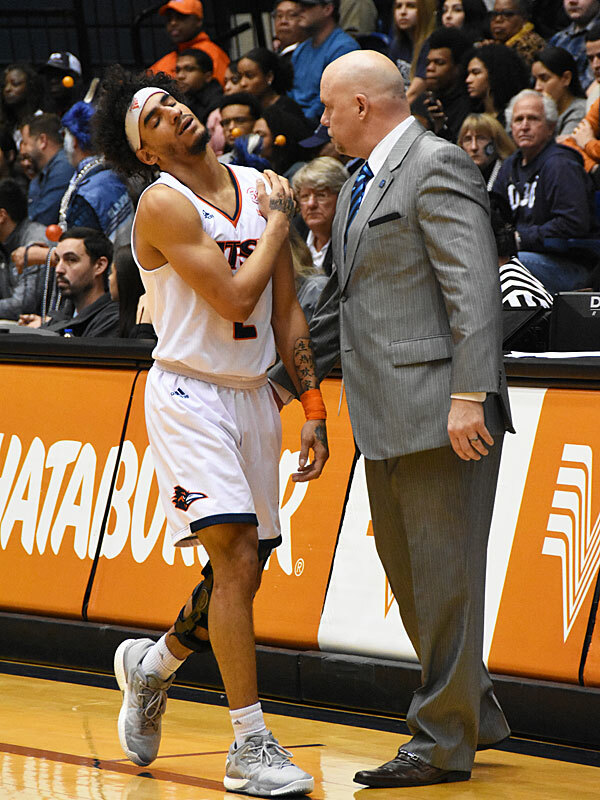 So many emotions were flowing on Sunday morning within the UTSA Roadrunners basketball program. It was Senior Day, with veterans Nick Allen and Giovanni De Nicolao both set to play perhaps their last game at home. On top of all that, the Roadrunners were hosting the dangerous UAB Blazers, with both teams bidding for a top-four finish in the regular season and a first-round bye in the Conference USA Tournament. Adding even more drama, both Allen and Jhivvan Jackson were less than 100 percent physically. Through it all, the Roadrunners emerged with a 76-70 victory in front of 1,259 fans. “I thought we fought really, really hard,” UTSA coach Steve Henson said. “Our defense was terrific … In the second half, (the Blazers) did knock down some three pointers. But overall our defense was great, our fight was great. “Nick got hurt in practice yesterday and really couldn’t put his shoe on this morning. Henson was equally impressed with Jackson, the leading scorer in Conference USA, who couldn’t practice the last few days with a left shoulder that he injured in Thursday night’s loss to Old Dominion. The loss to ODU left UTSA looking at the possibility of an 0-2 record to open C-USA bonus play in the five-team Group 1, with two games yet to play on the road to complete the regular season. After the season, Group 1 teams will be seeded into the C-USA postseason tournament, with the top four earning first-round byes. Now, after Jackson scored 27 points and Keaton Wallace added 22, the Roadrunners put themselves in good position to earn a bye. It’s especially important for UTSA, a team that plays with a seven- or eight-man rotation. Before the game, UTSA honored seniors Allen and Toby Van Ry. They also honored juniors De Nicolao and Mitar Stanocevic, who are graduating early. De Nicolao said afterward that it likely would be his last regular-season game at home for UTSA. He indicated he likely would play professionally next season in his native Italy. UTSA also celebrated the contributions of student manager Danny Soto. UAB — Lewis Sullivan 18 points and 9 rebounds. Zack Bryant, 15 points and 4 assists. Makhtar Gueye, 11 points and 8 rebounds. Jalen Perry, 11 points off the bench. UTSA — Jhivvan Jackson, 27 points on 9 of 20 shooting. Also, 7 rebounds. Keaton Wallace 22 points, 8 rebounds, 4 assists. Giovanni De Nicolao, 10 points, 4 rebounds, 3 assists. The Roadrunners took charge of the game early, holding UAB to 35 percent shooting in the first half. They also cashed in on the other end, hitting 53.6 percent, including 6 of 12 from three. UTSA finishes the regular season with road games Wednesday at Western Kentucky and Saturday at Southern Miss. UTSA is shooting for its first NCAA tournament berth since 2011. The only way to get there is to win the C-USA tournament, which is scheduled March 13-16 in Frisco. If the Roadrunners come up short of the Big Dance, Henson said a possibility exists that they could play in the postseason in one of the other events — the NIT, the CBI or the CIT. Jackson and Wallace buried three-point baskets in the last minute of the first half as UTSA assumed a 36-26 intermission lead against the UAB Blazers. At a pivotal moment in the season, the Roadrunners came out with energy and took control of the game almost immediately. They shot 53.6 percent in the first half, with Jackson and Wallace combining for 23 points. UTSA has lost three in a row at a critical juncture of the season. The UAB Blazers are in town today looking to put a fourth straight loss on the Roadrunners. On top of that, Jhivvan Jackson, UTSA’s leading scorer, may be at less than 100 percent. Less than 45 minutes before tipoff, Jackson, who injured his left shoulder Thursday night against Old Dominion, was not on the floor warming up. But with about 15 minutes remaining to tipoff, Jackson took the floor and started to shoot. I haven’t talked about any of this today with UTSA senior Nick Allen, but I can tell you emphatically that he is not fazed at all. He will play his heart out, no matter what. Well, for one thing, it could very well be the last time he plays a game at the Convocation Center. He’s a senior scheduled to graduate in May. Unless the Roadrunners play a postseason home game, this will be it for Allen. Maybe more importantly, I know he will play with an edge today because he has seen much greater adversity than this. Four years ago, in his first year on campus, the 6-foot-7 native of Arizona toiled through a season that ended with a record of 5-27. It was a humbling experience marked by some ugly losses and long stretches of utter futility. 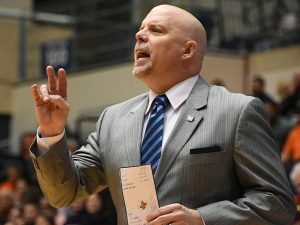 By February of that year, it became apparent to those close to the program that head coach Brooks Thompson likely would be dismissed. Sure enough, UTSA fired Thompson after the 2016 Conference USA tournament and struck out on a search for a new leader. The situation involving the future of the basketball program was unsettling enough for Allen, who would no longer get to play for the coach who recruited him to campus. But when he found out that Thompson was critically ill, it was a shock. After Steve Henson and the new staff arrived at UTSA, the emotions for Allen continued to churn. They crashed down on him completely when Thompson died at age 45. A week or so later, Allen was among the UTSA players who gathered at a memorial service in the Hill Country to pay respects to a man who had led the Roadrunners for a decade. Allen acknowledged in an interview Friday that the passing of his former coach was a difficult time in his life. “Once he did pass, it was the strangest part of my basketball life ever,” Allen said. Allen paused for a moment and continued, with his thoughts drifting off into a decidedly spiritual realm. Allen has been a key element in UTSAs turnaround as a program. He has played in 126 games and started 96 in his career, ranking fourth in starts and first in games played. Allen expressed a wide range of emotions in discussing what senior day will mean to him. “It’s a blessing,” Allen said. “I’m so appreciative of the city of San Antonio, of all the people that supported us. “So appreciative of the college, of UTSA, and so thankful for the coaches and what they’ve done for me. “I really can’t express how grateful I am. Honestly, it’s a lot to invest in some kid like me. 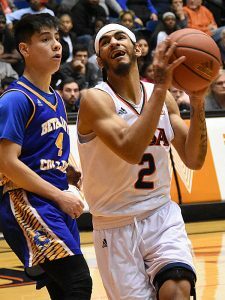 UTSA guard Jhivvan Jackson spent most of Friday afternoon’s workout either going through skill drills and shooting, or toiling with strengthening exercises to rehabilitate a sore left shoulder. When the Roadrunners competed in sets involving scrimmaging and contact, Jackson did not participate. It’s not a particularly good sign for the Roadrunners, who nevertheless are keeping a good thought that the right-handed Jackson can play against the UAB Blazers Sunday at 2 p.m. at the Convocation Center. Asked about the status of Conference USA’s leading scorer for the UAB game, UTSA coach Steve Henson said he didn’t know for sure. “You know, when we left last night, we felt pretty good about it. He woke up pretty sore today. Then we were concerned about it. But he did get some good treatment with (trainer) Josh (Modica),” the coach said. Jackson hurt the shoulder mid-way through the second half of a Thursday night loss to Old Dominion. After coming out of the game for a few minutes to stretch it out, he re-entered and played most of the last 10 minutes. On Friday afternoon, Modica worked with Jackson off to the side for much of the 90-minute drill. Forward Nick Allen isn’t worried about the matter. Because the UAB game is the last one on UTSA’s home schedule this spring, the Roadrunners will honor seniors Allen and Toby Van Ry and both juniors Giovanni De Nicolao and Mitar Stanocevic, who are both graduating. 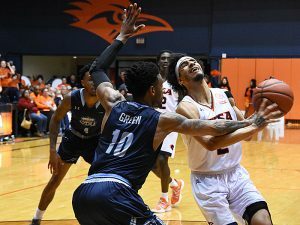 Even though Old Dominion has clinched the regular-season title, UTSA needs a victory to bolster its chances of gaining a first-round bye in the C-USA tournament. UAB (17-12, 9-7) defeated UTSA (15-13, 9-6) on Jan. 19 in Birmingham. The Blazers won by a score of 83-73 with a balanced attack that featured 53 percent shooting from the field and six players in double figures. After playing the Blazers, the Roadrunners will take on Western Kentucky and Southern Miss on the road to complete the regular season. 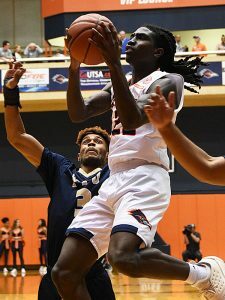 Old Dominion missed a free throw and left UTSA with an opportunity to tie the game in the final seconds Thursday night at the Convocation Center. But the Roadrunners didn’t get the three-point shot they wanted, settling for a too-late-to-matter layup by Jhivvan Jackson with a second remaining. After that, the Monarchs inbounded the ball, and the buzzer sounded on their 65-64 victory, which yielded both redemption and a Conference USA regular-season title. A month ago, UTSA erased an 18-point deficit and stunned ODU, 74-73, one of the biggest collapses in NCAA history with less than five minutes remaining. In the rematch, not only did the Monarchs make amends for their previous trip to San Antonio, they also won their first regular-season crown since 2010 when they were in the Colonial Athletic Association. The Monarchs (23-6, 13-3) can rest a little more easily now, though, knowing that they have the No. 1 seed in the C-USA tournament locked up. As for UTSA, much remains unsettled. The Roadrunners (15-13, 9-6) will need to regroup quickly to clinch a top-four finish in standings and a first-round tournament bye. In postgame interviews, Jackson said he slipped when he took a handoff from Keaton Wallace on the last possession. UTSA coach Steve Henson didn’t know why the play didn’t result in a three-point shot attempt. Jackson, the leading scorer in the C-USA, suffered a left shoulder injury and had to come out with 12:38 remaining. After having it worked on by the training staff, he re-entered the game with 10 minutes left and sparked hope with a dramatic drive for a layup. But his night turned sour a few minutes later when he picked up his fourth foul and had to leave the floor again. He didn’t score again until he hit the last layup. Od Dominion — B.J. Stith, 16 points and 12 rebounds. Ahmad Caver, 13 points and 10 assists. Xavier Green, 14 points. UTSA — Jhivvan Jackson, 21 points on 8 of 19 shooting, three assists. Keaton Wallace, 19 points, six rebounds. Old Dominion outrebounded UTSA, 43-29, including 15-4 on the offensive glass. With these two teams, what else would you expect? As soon as UTSA junior Giovanni De Nicolao released his shot from beyond halfcourt, it looked good. It was good. He swished it to stun the Monarchs, giving the Roadrunners a 34-32 lead at intermission. Trailing early in the game, the Roadrunners rallied with defense and hustle plays. Here, freshman guard Adokiye Iyaye flies to the rim past a few Monarchs players who should have been blocking out. Redshirt freshman center Adrian Rodriguez played well off the bench defensively after senior Nick Allen had to come out with his second foul. With Rodriguez in the game, UTSA stopped Old Dominion on several possessions in a row. UTSA started slowly on offense, but guard Jackson picked it up with a difficult jump shot. The Old Dominion Monarchs return to UTSA tonight with a chance to avenge an embarrassing 74-73 loss. On Jan. 26, the Roadrunners outscored the Monarchs 25-6 in the final 4:43 to win, prompting a wild celebration at the Convocation Center. For fans who witnessed UTSA’s miraculous 74-73 victory over Old Dominion on Jan. 26, the memory likely will linger for some time. The Roadrunners trailed by 18 points when a series of crazy plays ensued, allowing them to mount a comeback in the last 4:43 of the game. It was one for the ages, the second biggest rally in the last five minutes in NCAA history. At the time, the feeling among UTSA players was almost surreal, with many failing to fully comprehend what had just happened. Now, they get a chance to prove that it wasn’t a fluke. The Roadrunners can stay in the race for the Conference USA title with a win at home tonight against the Monarchs. UTSA’s Jhivvan Jackson leads Conference USA in scoring with a key home game against Old Dominion set for tonight. – Photo by Joe Alexander. Old Dominion, on the other hand, can clinch the regular-season championship with a victory. The Monarchs also are thinking about making amends. “We know that they’re going to come out strong,” UTSA sophomore Keaton Wallace said. “I know they’re going to be upset about the game last time. So, we expect them to come out and compete, and we got to do the same. Coming off a home victory over Western Kentucky last Saturday, Old Dominion has three games remaining. So, a Monarchs victory tonight would give them a three-game gap in the loss column with two left, which would clinch for them the No. 1 seed in the C-USA tournament. For UTSA to win the championship, it likely needs to win four in a row — against Old Dominion and UAB at home, and against Western Kentucky and Southern Miss on the road. UTSA hasn’t played since Feb. 16. 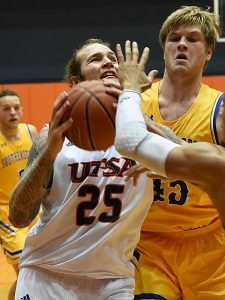 Players say they feel good physically entering their first taste of C-USA bonus play, but it remains to be seen if the time off will negatively affect their shooting. At a Tuesday afternoon practice, the Roadrunners seemed to be hitting a good percentage. Even players who don’t shoot much in games were knocking them down. The Nevada Wolf Pack hold the record for the largest comeback in NCAA history with the clock inside five minutes, according to the game notes for tonight’s game at UTSA. The Wolf Pack established the standard two seasons ago when they stunned New Mexico 105-104 in overtime. Trailing by 25 early in the second half at Albuquerque, the Wolf Pack were still down 19 with 4:27 left when they started to catch fire. Nevada made seven 3-pointers in the final 1:27 to tie the game 94-94 at the end of regulation. With 27 wins and only two losses, the Gonzaga Bulldogs on Monday moved up to No. 1 in the Associated Press Top 25 college basketball poll. Both Gonzaga and No. 2 Virginia climbed one spot after previously top-ranked Duke lost at home last Wednesday to North Carolina. Gonzaga, from the West Coast Conference, has built the nation’s longest winning streak at 18 games. All of the victories in the streak have come by double-figure scoring margins. Deep and talented, the Bulldogs beat Pepperdine by 28 points and BYU by 34 at home last week. Their streak notwithstanding, the Bulldogs haven’t been tested by many of the NCAA powerhouses this season, which will bring their ranking into question in some quarters. They won against Duke but lost back-to-back games against Tennessee and North Carolina in non-conference. Since then, they have stormed to a 14-0 record in the WCC and have boosted their nation-leading scoring average to 90.7 points per game. Virginia, by contrast, plays at a much slower pace and leads the nation defensively by holding opponents to 54.5 points. After a 64-52 victory at Louisville, the Cavaliers improved to 8-2 against ranked opponents. Virginia, third-ranked Duke and No. 5 North Carolina are all tied for first place in the ACC standings. Despite the loss to the Tar Heels, the Blue Devils dropped only two spots to third in the poll on the heels of their 75-65 road victory Saturday at Syracuse. Led by RJ Barrett and his 30 points and seven assists, Duke registered the win in its first game without injured star Zion Williamson. Williamson, the projected No. 1 pick in the NBA Draft, was hurt in the first minute against the Tar Heels. The American Athletic Conference-leading Houston Cougars, 26-1 on the season after a 71-59 home victory over South Florida, moved up one spot in the poll to eighth. The Cougars have won 11 in a row, and they lead the nation in field goal percentage defense (36.2). The Cougars are fifth in points allowed (60.3). The Texas State Bobcats on Saturday won their 22nd game of the year and moved into sole possession of first place in the Sun Belt Conference. They also did it in dramatic fashion, building an 18-point, second-half lead, falling behind by a point and then grinding out a 64-62 victory at home over the Louisiana Ragin’ Cajuns. Guard Nijal Pearson hit a three with 1:21 remaining for the final points of the game. After the last regular-season home game of the season, Bobcats coach Danny Kaspar took the microphone at courtside and thanked fans at Strahan Arena for their support. Texas State closes its regular-season schedule with three road games — at Troy and South Alabama and at UT-Arlington. The Bobcats (22-6, 11-4) hold a one-game lead on the Georgia State Panthers (19-9, 10-5) in the race for the Sun Belt title. Coastal Carolina, playing at home in Conway, South Carolina, beat Georgia State 95-82 on Saturday. Texas State — Tre Nottingham, 17 points. Nijal Pearson and Eric Terry, 13 apiece. Louisiana — Cedric Russell, 25. 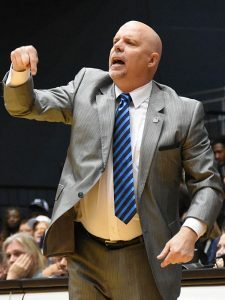 The Old Dominion Monarchs on Saturday took another important step toward a Conference USA regular-season championship. Trailing by three with 1:25 remaining, the Monarchs rallied with seven unanswered points down the stretch to defeat the Western Kentucky Hilltoppers, 67-63, at Norfolk, Virginia. It was the first game of the C-USA’s Group 1 bonus play, a new scheduling twist employed this season to boost the conference’s appeal in the eyes of the NCAA Tournament committee. Other teams in the group include the Southern Miss Golden Eagles, the UTSA Roadrunners and the UAB Blazers. UAB won on the road, defeating Southern Miss 76-72 in overtime in another Group 1 game later Saturday. 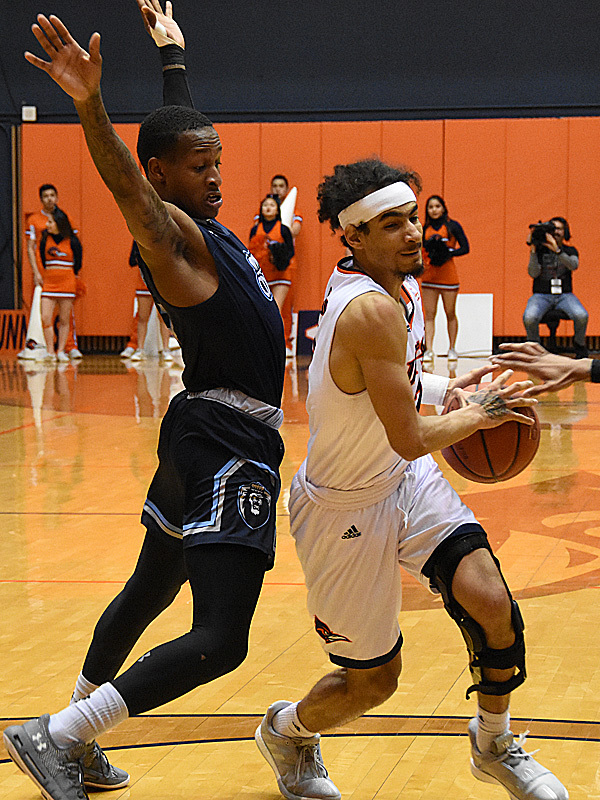 Group 1 teams will continue the stretch drive for the C-USA title Thursday night, when the Jhivvan Jackson- and Keaton Wallace-led Roadrunners host the Monarchs at the UTSA Convocation Center. UAB will host Western Kentucky. Down by three against Old Dominion, Western Kentucky made a late push when Josh Anderson hit a couple of free throws and Lamonte Bearden scored on a driving layup. Bearden’s bucket put the visitors up 63-60 with a little more than a minute remaining. A that point, Old Dominion reversed the momentum and tied the score with an Xavier Green three-point jumper. On the other end, Dajour Dickens blocked a shot by Hilltoppers’ freshman center Charles Bassey. Green promptly knocked down another shot, a two-point basket, to give the Monarchs a 65-63 lead with 16 seconds left. Western Kentucky went to Bassey again, and the former San Antonio high school standout got fouled. A free throw miss and a turnover by Bassey gave the ball to the Monarchs and allowed B.J. Stith to clinch it with two free throws for the final points. Note: Each team in Group 1 has four games in bonus play. At the conclusion of the bonus-play schedule, the standings leader is the C-USA regular-season champion. The top four get first-round byes in the C-USA tournament.